Public outcry against a huge electronic billboard promoting the Auto Mall has caused that item to be pulled from the Tuesday, Dec. 14 City Council agenda. The City Council will still hear arguments for the $8 million project that includes added parking spaces and a change in landscaping for the Auto Mall, the city's top source of retail tax revenue. The planning commission already voted 3-2 to approve the 35-foot-tall sign with a LED color screen with Commissioners Al Adam and Tina Grumney against it. That sign, if approved by City Council will replace an existing 20 feet tall by 30 feet wide sign. 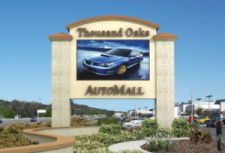 This is not the last Thousand Oaks residents will hear about bringing back the electronic billboard sign. Efforts will be made to sell the idea to the public and bring it back to council at a later date. "The Auto Mall wants to delay to win more time to convince folks the sign is needed," Council member Claudia Bill-de la Pena said. She also noted that the city would have to change its law to accommodate electronic billboards even if they go with a smaller sign. A mock version of the sign is now being shown where it is proposed to be built. If they change the law for one billboard, would that open up the opportunity for others to modify the view of Thousand Oaks from the 101 Freeway to look like billboard alley? Would a bigger sign bring more business to the Auto Mall, helping out the city to pay for needed services?